Years ago I did a little curriculum with my younger brothers called “5 in a row.” The concept was simple – you read the same book five days in a row and do a project each day that was related to the book. With some encouragement and ideas from my mom, I decided to try it out with my own kids and whatever books I found at the library. So far I’ve done 1 week with some success. This book explored different types of transportation with fun, colorful pictures and parody on the original verse of the song. 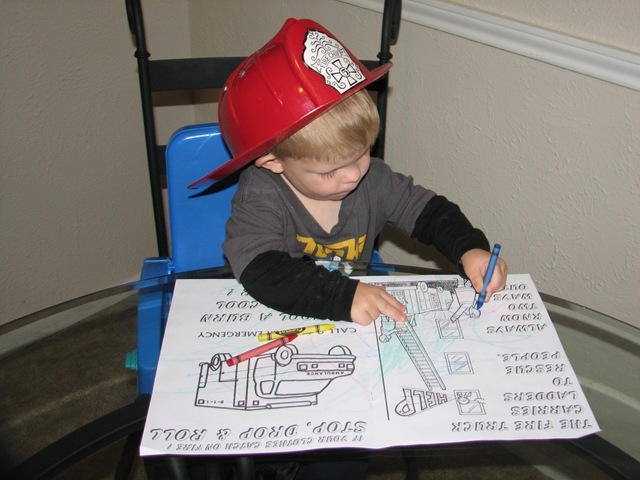 Day 1: Trip to the fire station (actually a spur of the moment trip because the library wasn’t open yet and the station was next door). 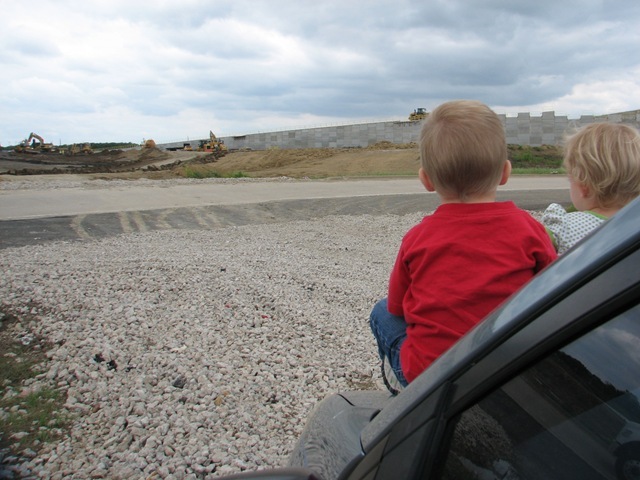 The next day we drove to a highway construction site to watch the bulldozers work. God provided a great place to pull off where there was a lot of action. Lance was sure disappointed when we had to leave. 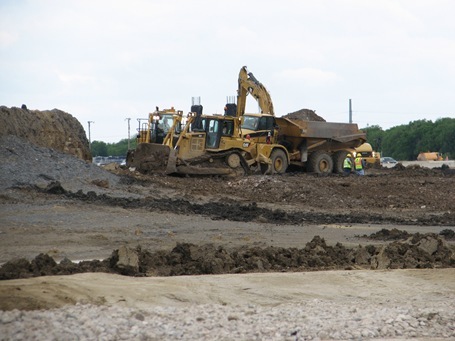 Close up of the trucks – we watched an excavator, dump trucks, bulldozers, a sprayer and some flatbed semi trucks. Third day was boats. 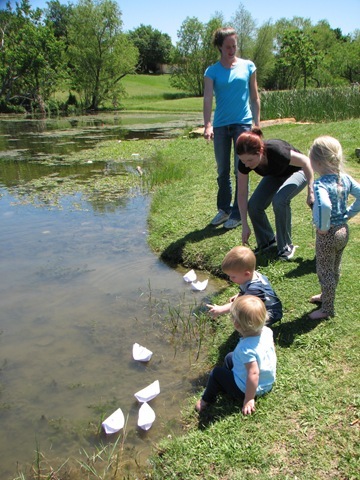 We had some friends over, folded paper sailboats and launched them in a nearby pond. The wind was nil so they mostly floated next to the shore. Lance was very intrigued. Last day was the rocket (I know, this was only four days but I started late due to the library being closed on Monday). Lance was very excited about this project though I’m not sure he knew what would happen. Rocket launches need video so here goes. Disclaimers: No kids or animals were harmed in the making of this movie. Pardon the outfit, we had just been jogging. Pardon Lance’s outfit (or lack). Life happens, and so do accidents. Cute! We did this at home….as kids…. I remember doing “Five in a Row” and other sorts of similar activities. 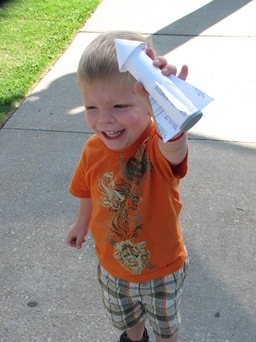 Rockets were some of the best experiments. I can’t wait to do stuff like this with Jenny. Do not try this at home???? Why not??? It couldn’t be any harder than shooting flaming arrows. Looks like a very successful first week of 5 in a Row. Okay, that sounds really awesome. So is this a set of books you buy? I’m very intrigued! Dill and I loved your Rockets and boats…. We have a question. What was the rocket base?